For some reason, the April showers haven’t quite hit San Diego like they normally do and the weather has been fantastic lately. Warm days and a nice breeze are why I love living in Socal and this past weekend I decided it would be a good time to take my sister(age 5) to Sea World. Even though it wasn’t too crowded, there was still a ton of people there and I couldn’t help but think about how much money everyone was spending. From admission tickets to stuffed animals and concessions, money was flying around almost as if Sea World was paying us to visit the park. Unfortunately that’s not the case, but I thought of some travel tips that should save you anywhere from a little to a lot(depending on how extreme you are) of money at Sea World(or any park for that matter). All it takes is a bit of planning, so onto the ways to save. I love buying things on Craigslist and I’ve now completed successful purchases with Disneyland and Sea World tickets. You have to be careful on Craigslist because unfortunately there are some scammers out there, but as long as you use a common sense approach, your chances of getting screwed over will be very minimal. You used to be able to just look at a ticket and if the stub was still attached it was still good. But these days, a lot of tickets have scannable bar codes instead of a tear-off portion so don’t automatically assume your tickets will be valid if they look ok. I actually receive hard tickets for my Chargers season seats but I can override them at any time and print out e-tickets. If you’re buying from a private seller, try to get some personal information from them, like where they work or their home address. Basically anything that you could use against them should the tickets turn out to be fakes. I like dealing with small time ticket brokers since they offer the best discounts and can usually prove to you that they are legitimate. Buying tickets on Craigslist isn’t for everyone though. It can be nerve-racking since you won’t know for sure that your tickets are good until you step foot inside the venue. There will always be a greater supply than demand when it comes to these types of tickets so don’t be scared to just walk away if something doesn’t feel right. I found an ad on craigslist for $35 Sea World tickets and the seller I bought them from actually had a blog where she posted all her positive feedback. She also offered to e-mail me the tickets and told me I wouldn’t have to pay until Monday at 11 am. That was fine with me since now I assumed no risk of getting scammed out of my money. It all worked out perfectly, I got the e-tickets morning of, went into the park and paid the next day via Chase QuickPay. I ended up only spending $105($35 * 3) for 2 adult and 1 child tickets(full price would have been $226: $78 for adults and $70 for a child). I don’t really enjoy paying $5 for sodas and $10 for an average burger so I always plan ahead and bring food. Most parks won’t let you bring actual food inside the park so instead bring a cooler and leave it in your car. You can usually bring in small snacks like bags of chips, nuts, fruit snacks, etc (and of course water) so toss it all in a backpack and you’ll have something to snack on until lunch time. If you’re on the adventurous side, you can always try and sneak in a full picnic at the bottom of your backpack or purse. At a recent music festival I went to, I actually saw a couple people(not going to name any names) sneak in alcohol in a sunscreen bottle. Just make sure you wash it out well! At Sea World, all they did was poke around with a wooden stick for about half a second. I almost felt ashamed that I didn’t try to sneak in more food. We ventured the park for about 3 hours before we got hungry so we got our re-entry stamps and headed back to the car for a picnic. It was actually nice to sit down, turn the A/C on for a while and relax and eat. I absolutely hate paying for parking but this was the one time I had to give in since there was nothing available within a reasonable distance. I even did a quick google search the night before for free parking but came up dry. It was ‘only’ $15 to park though so I figured it was worth it since we were going to spend most of the day walking already. It also allowed us to leave the food close by so we could have a picnic lunch when we got hungry. I think the best alternative to paying for parking would probably be public transportation. There are usually lockers out front of most parks so you could probably leave a cooler or two there if you’re set on picnic’ing, otherwise take the bus and spend all the money you save on junk food inside the park. I finally realized why all these rides end in a gift shop: it’s for the kids. My sister nearly broke into tears when I told her I wasn’t going to buy her this cute baby beluga whale stuffed animal. Eventually, I succumbed to her superpowers and we went back and I bought it for her(at least it was only $10). But you do have to be careful when you’re visiting with kids since there are a lot of things they will want. I told my sister she could pick out one thing and the whale was what she chose. That made it a lot easier later on in the day, when she wanted a turtle, dippin’ dots, ice cream, etc haha. I’ve never had to stay overnight to visit an amusement park but I could only imagine how much that would cost(especially with kids). I’d try and find a friend that lives nearby and stay with them or maybe use up one of my free hotel nights from a credit card sign-up bonus. Readers, are there any other tips that I should know about? I’m pretty lucky to live within 100 miles of 10 major theme parks so I’m sure there are a couple things I haven’t thought of. Bringing your own food is key to saving money. They charge a fortune for the smallest things these days. Yea I agree, we actually didn’t have to buy one thing since I brought in a frozen water bottle and a bunch of snacks. We walked back to the car for lunch and had a nice feast, I loaded up my bottle with ice again and we were good to go for the rest of the day. We always bring our own food to parks like these! We look like total dweebs, but we don’t care. I’d rather look dorky and eat my own snacks than spend $10 for a coke and bag of M&Ms. Haha I actually think the people waiting in line for cokes and snacks are the ones who look like fools! The funny thing is the food in these parks isn’t even that great. It’d be one thing if you were paying more for higher quality food but the food in the park is just regular ol’ food haha. Admission tickets are so outrageous these days! We get a slight discount at work, but nothing as significant as CL prices so I’ll have to look into that next time. I agree about keeping a cooler in the car – putting the A/C on and eating inside is a nice relief when it’s hot! Yea I’ve found all the discounts offered through my work are pretty lame! Like I said, buying on CL isn’t for everyone but that’s where you can get by far the best deals. I usually just assume everyone is going to scam me, that helps me stay on my toes. Great tips! I always bring my own food to amusement parks. It definitely saves a ton of money! Nice sounds like everyone already knows about that one! Hmm my BF and I are actually heading to California this summer, though not sure if we’ll make it to San Diego. Great tips though! Awesome, well if you plan on going to any amusement parks, make sure you don’t pay full price! Great stuff Harry! I think bringing your own food is a huge key to saving money at amusement parks. When we went to Disney last summer, we took our lunches in a backpack and then bought drinks inside the park. Then we only had to purchase dinner if we stayed late. For our family of six, we probably saved close to $50 per lunch. Over a four day visit that really adds up. We also stayed off site for our Disney trip and rented a really nice house ten minutes from the park. Saved a bunch of money for a weeks stay. Yea I can only imagine how expensive it gets with a family. Luckily for now, it’s only me and my fiancee but there will be more eventually haha. Can you believe that I’ve never been to Sea World? The last time I was in California I was 8, and we didn’t hit up Sea World. I think these are applicable at any amusement park! That’s a shame haha! 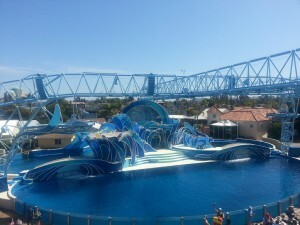 Everyone should go to Sea World at least once during their childhood, it’s so fun and somewhat educational too. I went when I was little, but this was the first time I went as an adult and it was just as awesome as I remember(even as an adult!). You are right about purchasing tickets online. There are lots of things you can find on Craigslist and for a lesser price too. But we are still to make our trip there. I’ll keep your tips in mind. Thanks, yea I love craigslist. I buy and sell all the time on it. Can you email me the contact info for the seaworld ticket? I’ve forwarded you Monica’s contact info 🙂 Have fun. Thanks Joe, I just sent you an e-mail. Hi Jeff, unfortunately she’s not selling tickets anymore but I do still see quite a few listings on CL right now. I think as long as you use common sense, you should be just fine buying tickets from someone. I am planning seaworld trip in February. Checking if any one recently purchased ticket from CL. CL seller contact info will be helpful. Sorry Alvin, don’t think she’s selling tickets anymore. I’m on the lookout for someone new though. Hello, thanks for the great article! Great ideas~ how do you avoid the scams? Is it best to meet someone at the park? I too would appreciate your connection. Hello, would you be able to share the craigslist seller you purchased the tickets from please? Sorry Dolores, don’t think she’s selling tickets anymore. My advice would be to find someone else on CL who won’t make you pay until after you’re in the park.. Thanks for the quick reply, I was able t o do a quick craigslist search in Sandiego and was able to find a few different sellers. Hopefully I have the same luck you did. Has anyone recently found a genuine seller on CL? I would appreciate if you can share the contact information of the seller. Sorry Ilyas, no one has told me about any sellers but I do see that there are still listings offering tickets and they don’t make you pay until after you’re in the park. I’d go with one of those sellers. I am curious why the seller would trust people to pay after they enter the park? Hi! Can I get Monica’s details as well? I am going there this weekend and would love to find out her deets! Sorry Christina, Monica is MIA but there are still some other sellers on CL. Who’s Mark?? 🙂 Yea that sounds like a good deal. I’d probably go with paypal/credit since you can always challenge the transaction if the tickets turn out to be fakes. Assume the worst but as long as you’re smart about it, it should be fine. I’ve done tens of sports games, amusement parks, etc(at huge discounts) using this philosophy. Sound like a good deal, any tips to distinguish real deal or fakes? It’s really tough to distinguish real from fakes now that a lot of tickets can be scanned which is why I recommend some type of protection. Either pay with paypal, credit card or don’t pay until after you’re in the park. Hello. Wondering if after a year you’ve found a legit CL seller for seaworld tix.